Rene Burri artist page — g a macura inc. 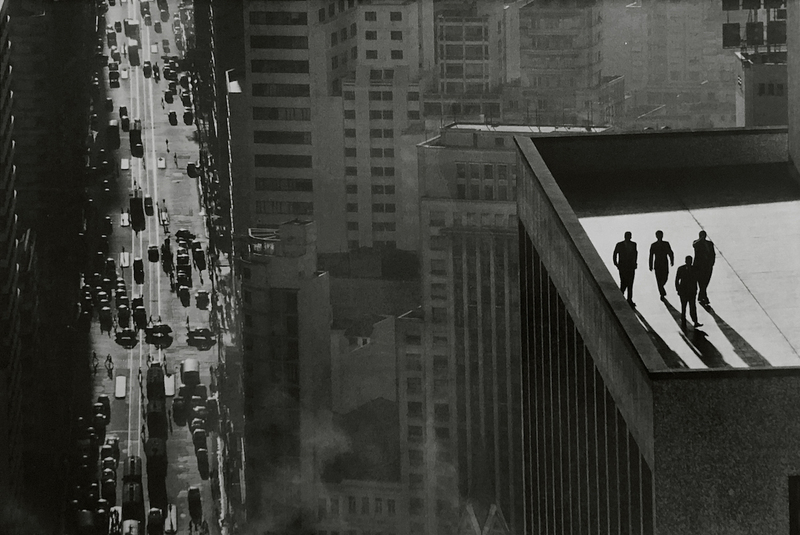 The late master of documentary and street photography, Burri was mentored early on by Cartier-Bresson, but went on to develop a unique style. He photographed famous figures like Che Guevara and Pablo Picasso and documented some of the major events of the late 20th century after joining Magnum Photos in 1959, enjoying a career of more than 50 years. Other works available from g a macura inc.
"The Men on a Rooftop photo came about as part of a process of doing a story on the city, and all the people in a city and all the contradictions of the city. Really, I was just travelling around, it was an assignment. But the more and more I got in touch with, how should I say, my own vision about things - which sometimes went a little bit beyond what the people expected from a more popular view on a city or a theme - I found out things for myself. It was ‘self-inflicted’ in a way. Some of my own stories and ideas just came out better than when someone sent you somewhere and said, ‘Do this’ or ‘do that’. Because when you got to the place it looked completely different. So when you came back with something they’d say ‘oh that looks really interesting’. . . . Did I know those men were there when I took that photograph? No. I went up there out of curiosity. I remember taking the elevator to the roof. Buildings weren’t guarded in those days; they didn’t have guardians as they have now. It was a question of getting to the top and knocking on the door. And then saying excuse me’. Excusez-moi, ce que je peux faire une photo? Desculpe-me, posso tirar uma foto? ‘Yeah, yeah, yeah. Come in!’ so I walked out onto the terrace and at that moment those guys came from nowhere and I shot five images." René Burri studied at the School of Applied Arts in his native city of Zurich, Switzerland. From 1953 to 1955 he worked as a documentary film-maker and began to use a Leica while doing his military service. Burri became an associate of Magnum in 1955 and received international attention for one of his first reportages, on deaf-mute children, 'Touch of Music for the Deaf', published in Life magazine. In 1956 he traveled throughout Europe and the Middle East, and then went to Latin America, where he made a series on the gauchos that was published by Du magazine in 1959. It was also for this Swiss periodical that he photographed artists such as Picasso, Giacometti and Le Corbusier. He became a full member of Magnum in 1959, and started work on his book Die Deutschen, published in Switzerland in 1962, and by Robert Delpire the following year with the title Les Allemands. In 1963, while working in Cuba, he photographed Ernesto 'Che' Guevara during an interview by an American journalist. His images of the famous revolutionary with his cigar appeared around the world. Burri participated in the creation of Magnum Films in 1965, and afterwards spent six months in China, where he made the film The Two Faces of China produced by the BBC. He opened the Magnum Gallery in Paris in 1962, while continuing his activities as a photographer; at the same time he made collages and drawings. In 1998 Burri won the Dr Erich Salomon Prize from the German Association of Photography. A big retrospective of his work was held in 2004-2005 at the Maison Européenne de la Photographie in Paris and toured many other European museums. René Burri lives and works in Zurich and Paris. René Burri passed away at the age of 81 on October 20, 2014.